1. An animal cell placed into a 0.9% solute solution would do which of the following? 2. When during cell division do chromosomes move to opposite poles of the cell? 4. What structure is common to ALL cell types? 5. A buck with a large, impressive rack of antlers sires four offspring, three males and one female. The three male offspring also have large, impressive antlers, but before being able to reproduce, two of the male offspring get their antlers tangled in a low-hanging tree and are caught and killed by wolves. A second buck with a smaller set of antlers sires three male offspring; all of these males have smaller antlers like their father. They are more effective at escaping predators and successfully reproduce. In terms of evolution, which of the original bucks is more fit? A. The buck with the larger antlers because he sired more offspring. B. The buck with the smaller antlers because more of his offspring survived. C. The buck with the larger antlers because he will be more successful at attracting a mate and continuing to reproduce. D. The buck with the smaller antlers because he is more effective at escaping predators and will continue to reproduce. E. Both bucks are equally fit. 6. A population of ampicillin-resistant bacteria (Strain 1) is grown in a laboratory and is infected with a virus. The bacterial population begins to decline as the virus initially goes through the lytic cycle, then rebounds as the virus integrates into the bacterial chromosome to begin the lysogenic cycle. The bacteria reproduce normally until they are heat-shocked. The rapid increase in temperature causes the virus to remove itself from the bacterial genome and enter the lytic cycle. Within several hours all bacteria are dead and a free virus is found in high concentration in the bacterial growth medium. This free virus is used to infect a population of bacteria that is sensitive to ampicillin (Strain 2). After the expected decrease and rebound of this bacterial population (as above), the rebounded population was found to be ampicillin-resistant. 7. A population of ampicillin-resistant bacteria (Strain 1) is grown in a laboratory and is infected with a virus. The bacterial population begins to decline as the virus initially goes through the lytic cycle, then rebounds as the virus integrates into the bacterial chromosome to begin the lysogenic cycle. 8. A population of ampicillin-resistant bacteria (Strain 1) is grown in a laboratory and is infected with a virus. The bacterial population begins to decline as the virus initially goes through the lytic cycle, then rebounds as the virus integrates into the bacterial chromosome to begin the lysogenic cycle. 9. A population of ampicillin-resistant bacteria (Strain 1) is grown in a laboratory and is infected with a virus. The bacterial population begins to decline as the virus initially goes through the lytic cycle, then rebounds as the virus integrates into the bacterial chromosome to begin the lysogenic cycle. Which of the following increase genetic diversity in bacteria? 10. Questions below refers to the following experiment involving human liver cells. Aspartate aminotransferase (AAT) is an enzyme produced in liver cells that catalyzes an important step in the metabolism of amino acids. 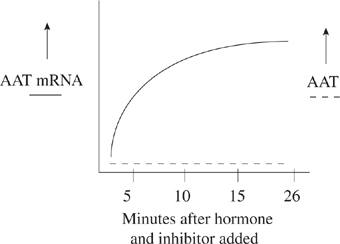 The production of AAT is dependent upon various hormonal stimuli. Human liver cells were cultured; half the cultured cells were used to measure the amount of AAT mRNA present, and half were used to measure the amount of AAT present. 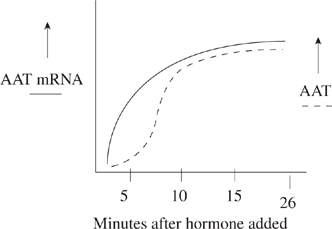 Measurements were taken at five-minute intervals following hormonal stimulation of the cells. Figure 1 shows the results of this experiment. The experiment was repeated, this time adding an inhibitor of protein synthesis along with the hormone. Figure 2 shows the results of this experiment. 11. Questions below refers to the following experiment involving human liver cells. 12. Questions below refers to the following experiment involving human liver cells. 13. Questions below refers to the following experiment involving human liver cells. 14. β-galactosidase (β-gal) is a bacterial enzyme used in the metabolism of lactose. Three different groups of human intestinal bacteria were cultured in a glucose-based medium. At Time 1, the bacteria were transferred to media containing lactose as a nutrient source instead of glucose. At Time 2, the bacteria were returned to the glucose-based medium. Samples of bacteria were removed at five-minute intervals and tested for the presence of β-gal. The results are presented below. What could account for the delay in β-gal production after Time 1 seen in Group 1 ? 15. β-galactosidase (β-gal) is a bacterial enzyme used in the metabolism of lactose. Three different groups of human intestinal bacteria were cultured in a glucose-based medium. At Time 1, the bacteria were transferred to media containing lactose as a nutrient source instead of glucose. At Time 2, the bacteria were returned to the glucose-based medium. Samples of bacteria were removed at five-minute intervals and tested for the presence of β-gal. The results are presented below. Why is it an advantage to intestinal bacteria to be able to induce β-gal production in this way? A. Humans do not consume foods containing lactose all the time. B. It prevents toxic buildup of lactic acid. C. β-gal is harmful to bacteria. D. It prevents the bacteria from using glucose as a nutrient source. E. Lactose is harmful to bacteria. 16. β-galactosidase (β-gal) is a bacterial enzyme used in the metabolism of lactose. Three different groups of human intestinal bacteria were cultured in a glucose-based medium. At Time 1, the bacteria were transferred to media containing lactose as a nutrient source instead of glucose. At Time 2, the bacteria were returned to the glucose-based medium. Samples of bacteria were removed at five-minute intervals and tested for the presence of β-gal. The results are presented below. 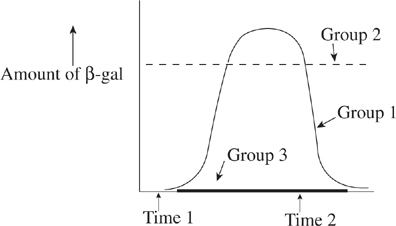 Which of the following could be reasons for the inability of Group 3 to produce β-gal? 17. Situation 1: A species of moth is preyed on by bats. Over hundreds and hundreds of years, the moths develop a sophisticated pattern of flying when they hear the screech of a bat. This helps them escape danger. Other changes occur as well, and when an attempt is made to mate the current moth with its ancestor moth, no viable eggs are produced. Situation 2: A species of frogs is living in a pond near an earthquake fault line. A sizable earthquake separates the frog population into two separate populations. After hundreds and hundreds of years, the two groups are unable to mate. 18. Situation 1: A species of moth is preyed on by bats. Over hundreds and hundreds of years, the moths develop a sophisticated pattern of flying when they hear the screech of a bat. This helps them escape danger. Other changes occur as well, and when an attempt is made to mate the current moth with its ancestor moth, no viable eggs are produced. 19. Situation 1: A species of moth is preyed on by bats. Over hundreds and hundreds of years, the moths develop a sophisticated pattern of flying when they hear the screech of a bat. This helps them escape danger. Other changes occur as well, and when an attempt is made to mate the current moth with its ancestor moth, no viable eggs are produced. 20. Situation 1: A species of moth is preyed on by bats. Over hundreds and hundreds of years, the moths develop a sophisticated pattern of flying when they hear the screech of a bat. This helps them escape danger. Other changes occur as well, and when an attempt is made to mate the current moth with its ancestor moth, no viable eggs are produced. If the earthquake in Situation 2 left one group of frogs without a water source, would the frogs be able to survive and reproduce? A. No, frogs are amphibians and can live only in water. B. No, frog eggs must be laid in water because they lack a shell. C. Yes, because amphibians frogs can live on both land and water. D. Yes, frogs have a thick scaly skin, which protects them from dehydration. E. Yes, the frogs would quickly adapt to the new environment.